If you are looking for more tomato recipes, a few of our favorites include this Pasta Pomodoro Sauce, Homemade Salsa, and this Easy Shrimp Creole recipe. This is the THIRD time that it has snowed in Austin, TX since December. Unlike last winter, this one has been full of days with highs in the 40s and lows in the 30s and even 20s. Because of that, Cohl and I have been eating A LOT of soup. Making an enormous batch of Butternut Squash Soup, White Chicken Chili or this Roasted Tomato Basil Soup has been the only way we have been able to stay warm and healthy this winter! How Do You Make Roasted Tomato Basil Soup? 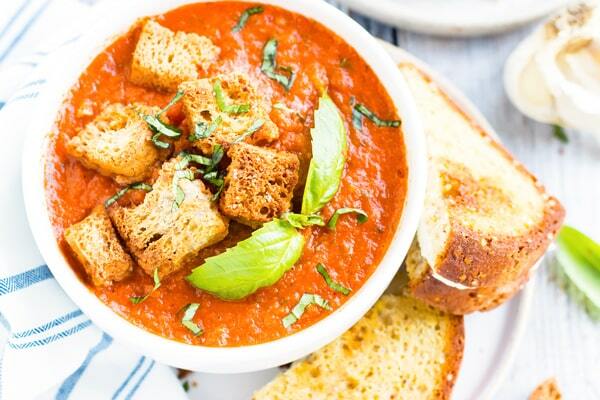 Making this roasted tomato basil soup is actually super easy. All you will need is a pan for roasting the tomatoes, onions, and garlic, a way to puree the tomatoes, and a large pot for bringing the soup all together. This is my go-to pan for roasting the tomatoes and this is my new favorite pot for making soups! How Do You Puree Tomatoes for Tomato Soup? Food processor– this is the way I mention in the recipe below. Hand Immersion Blender– using this can work, but it may get a little messy! Vitamix– using this will give you the creamiest soup! 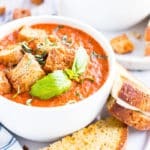 Is Roasted Tomato Basil Soup Good for Me? Yes, yes, and profoundly… yes! 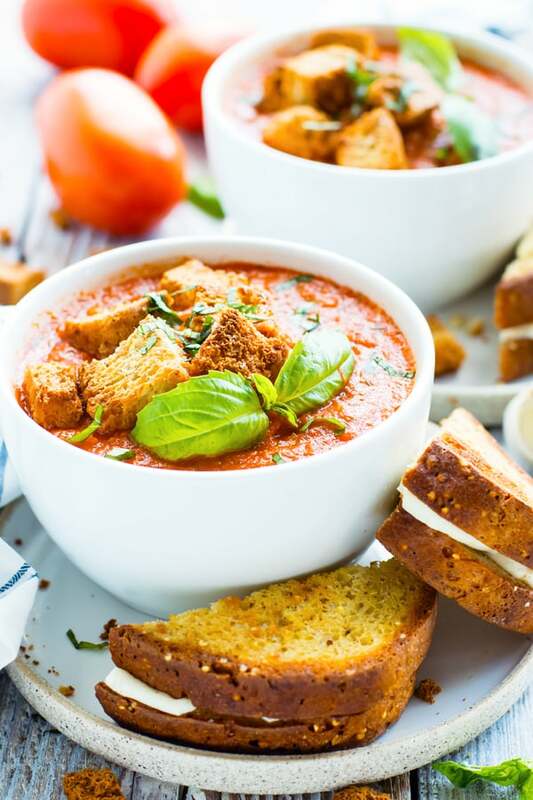 This roasted tomato basil soup is gluten-free, vegetarian, vegan, dairy-free, Paleo, and low-fat! The antioxidant lycopene, a huge protector against heart disease and cancer. 50% of your daily Vitamin A per serving. 75% of your daily Vitamin C per serving. 6 grams of fiber per serving. Tons of Potassium and Folate. How Can I Evolve this Roasted Tomato Basil Soup? Feel free to use almond milk, coconut milk, cashew milk, or soy milk. Try out different varieties of tomatoes to change up the flavor. Avocado oil works as a great substitute for olive oil. Use bone broth instead of the vegetable or chicken stock for added collagen and immune boosting properties. Add even more herbs such as fresh oregano or rosemary. 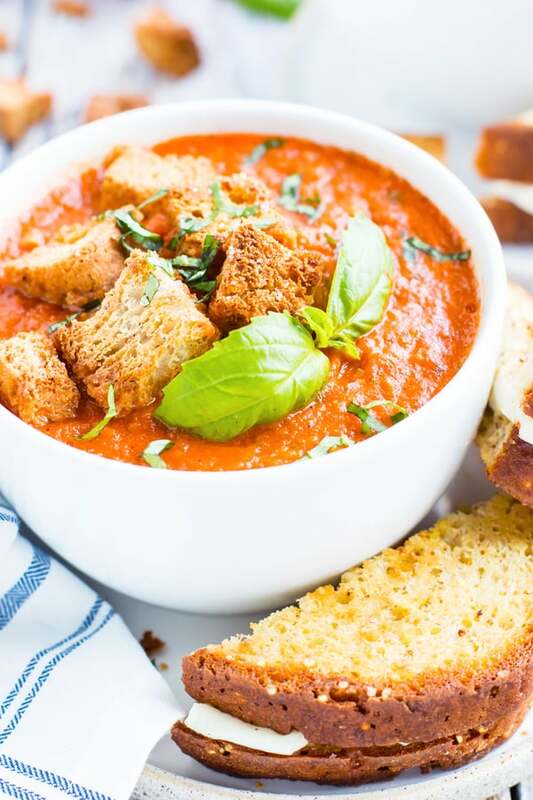 Roasted tomato basil soup is a super simple soup recipe that is bursting with fresh tomato flavor! 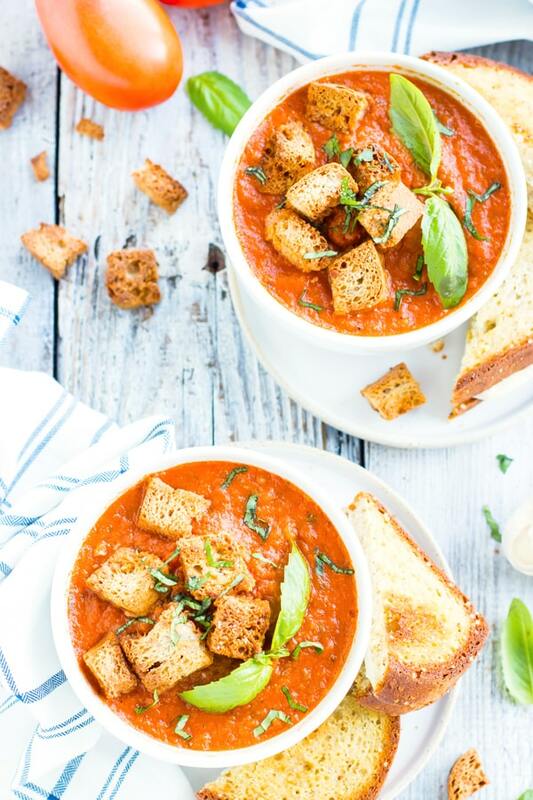 This vegan and dairy-free tomato soup is the perfect way to load up on the antioxidant lycopene and get tons of Vitamin C, K, and folate. Place tomatoes on a large parchment-paper-lined baking pan in a single layer. Place onions and garlic on the same baking pan, if room permits, or on a separate parchment paper-lined baking pan. Drizzle olive oil and sprinkle 1 teaspoon salt and ½ teaspoon pepper over tomatoes and onions. While vegetables are cooking, combine canned tomatoes, broth, basil, thyme, and milk in the bowl of a food processor. Process for 1-2 minutes, or until completely smooth. Add processed tomatoes to a medium-large pot. Once vegetables are done roasting, add them to the same food processor bowl along with any oil that remains on the parchment paper. Process until smooth. Add processed vegetables to the pot and bring the soup to a simmer. Simmer for 10-15 minutes. Add remaining 1 ¼ teaspoon salt and ¼ teaspoon pepper to taste. Serve with gluten-free croutons, Paleo crackers, toasted baguette, or homemade grilled cheese sandwiches and enjoy. See this recipe in Meal Plan #5. Food processor- this is the way I mention in the recipe above. Hand Immersion Blender- If you use this simply add all ingredients to your large pot and blend with the immersion blender. Vitamix- Follow the same steps above and decrease your blending time until your desired consistency is reached. 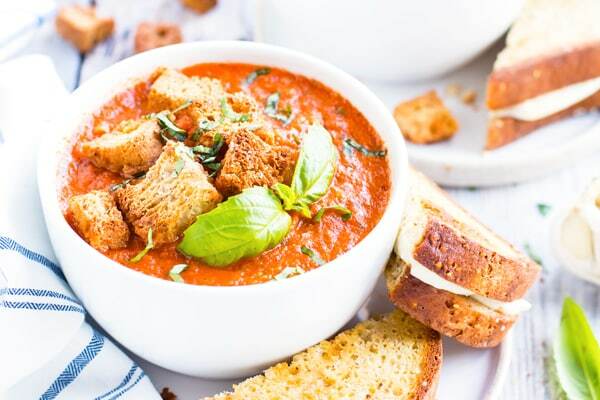 Want more recipes like this Roasted Tomato Basil Soup? Yum! Can’t wait to try this recipe soon. Right?! Tomatoes are a powerhouse FULL of Vitamin C! Thanks so much for the sweet comment and review! I made this recipe last night and it was AH-MAZING! Tasted like a creamy delicious tomato basil bisque without all the guilt. I used a hand immersion blender and it was so easy. Thank you for the recipe! It’s becoming a staple in our household! Hi Sydney!! I am SO happy you enjoyed it! The immersion blender can definitely make creamy soups a breeze. Thanks so much for your comment!! Absolutely, Mary! This soup freezes great and will keep well for up to about 6 months! Really, really good. And so easy. My daughter loved it, and has requested another batch. Yay, Meg! I am so happy you and your daughter enjoyed the soup. Thanks so much for your comment and rating!! This soup looks amazing! 🙌🏻 I’m excited to try it! Would this recipe work with using all fresh tomatoes and omitting the canned tomatoes? I have a huge bag of tomatoes to use and no canned ones on hand right now. Also, would I need to do anything different if using all fresh tomatoes? (boil them or just roast extra?) Thanks for your help! So excited to try this recipie! I would also love to use fresh tomatoes.im not suppose to eat can tomatoes at the moment.how many more would u use?